I felt like the OnePlus Two was the worst of them all, very jittery and auto focus is moving constantly followed by LG G4, which did fairly well but Galaxy S6 seemed to have the best overall stable focus and OIS. Of course, we would never recommend you to record a video while walking unless you absolutely had to. Wow, the OnePlus Two is still jittery as hell while LG G4 and Galaxy S6 both did fairly well. 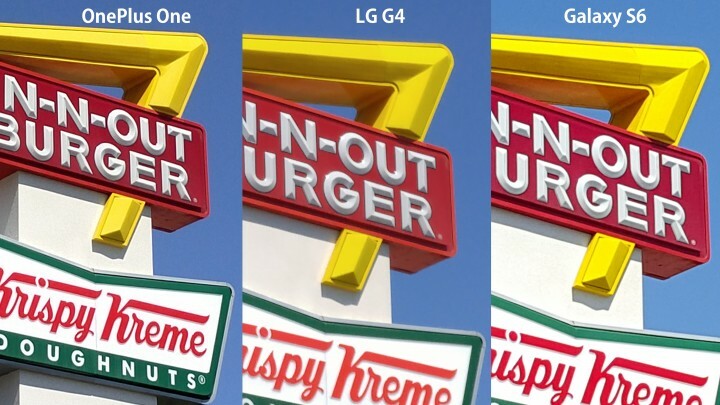 I felt like the LG G4 had slightly more real colors while the Galaxy S6 did have more saturated colors while being a tad smoother than the LG G4. 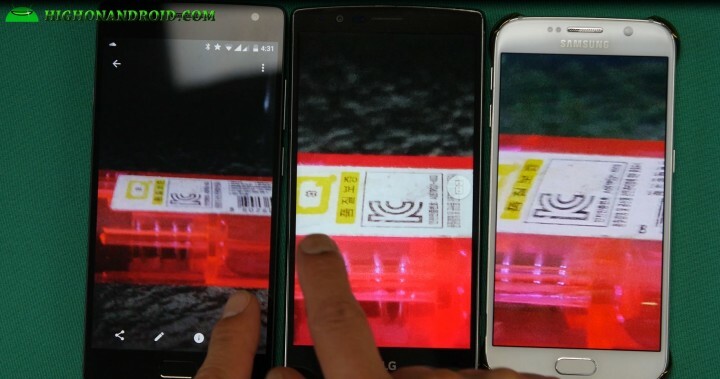 The longboard test proves how bad the auto focus is on the OnePlus Two while it LG G4 and S6 handles them like pros. In real world testing, I found that the auto focus is really bad on the OnePlus Two, it’s not suitable for anything but when using a tripod or held very still on a flat surface. Galaxy S6 definitely has an edge over both OnePlus Two and LG G4 due to its wider angle lens and also higher 2K recording option. There’s no doubt that for vloggers who want to use the front camera often, you will get the best video and audio by using the Galaxy S6. 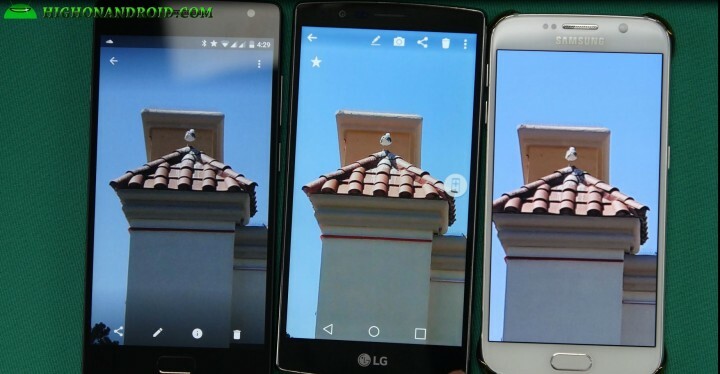 Overall, video recording and optical image stabilization seems to be clearly much better on the LG G4 and Galaxy S6, with S6 edging out the LG G4 in terms of smoother videos with its higher bitrate. OnePlus Two’s OIS capabilities are not bad but they are still jittery even when using a smartphone stabilizer. I am a bit disappointed at OnePlus Two’s video recording capabilities but let’s go take a look at some of the still shots. In this first test, let’s have a quick look at what I had for lunch today, taken indoors in good lighting. I think in good lighting, all the cameras perform pretty decent. Although I would give a slight edge to Galaxy S6 for more details when zoomed in, I would say all of them take pretty decent shots in good lighting. Okay, here’s another test of a bird and owl on the roof of Krepsy Kreme. In this example, I think the LG G4 comes out on top again with ever-so-slightly more details in the colors over the Galaxy S6 while the OnePlus Two seems a bit more pixellated along with darker shadows and you can’t see the colors as well. In this final test, we take it to the limit and do our low-light test with a minimal LED light in complete darkness. We try to see which phone has the best low-light sensor, this should be fun. 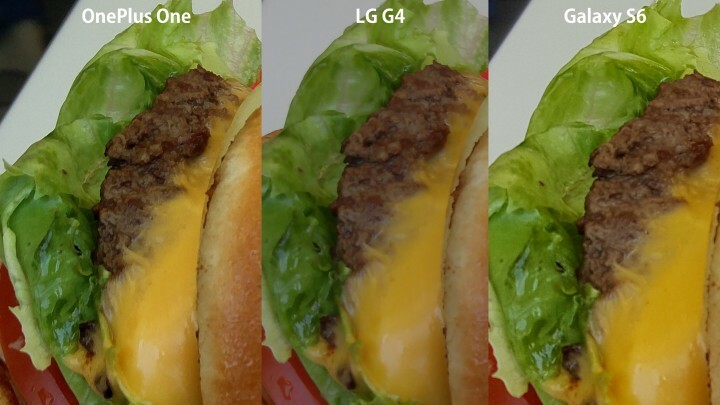 As you can see, the LG G4 did the best out of them all, giving you more clearer photo with more detail and less noise while the OnePlus Two and Galaxy S6 suffered lots of noise. So, what does this test tell you? 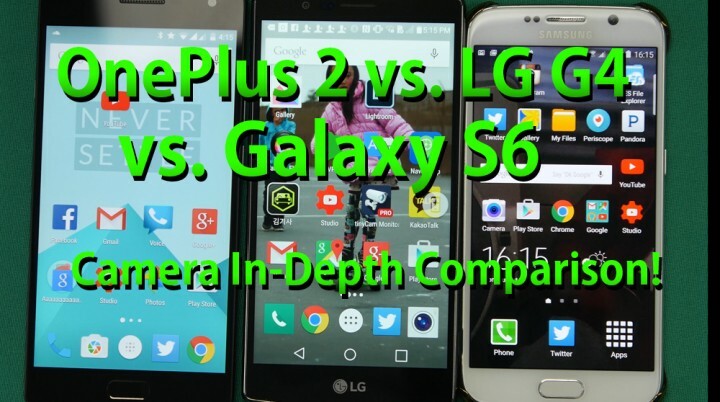 OnePlus One’s camera for videos and photos are not going to be better than the LG G4 nor the Galaxy S6. But don’t be disappointed because it’s still got a pretty decent still camera and 4K recording should be pretty good so long as you use a tripod. However, if you absolutely need to take great stable 4K videos, you might want to consider the Galaxy S6 followed by LG G4 and avoid the OnePlus Two. If you need the best still camera on a smartphone rather than video, you probably can’t go wrong with the LG G4 as it does a tad better over the Galaxy S6, especially in low-light and bright sun. Hey, maybe you don’t use the camera often, you really don’t take much photos and videos and want to get a phablet device under $400, you can’t go wrong with the OnePlus Two. Even though the OnePlus Two does not hold up to an LG G4 nor Galaxy S6, I still love using it due to other features like being easy to root and install custom ROMs, full dual-SIM support, and you can buy two LG G4 or Galaxy S6 for the same money spent. Besides that, I carry my Canon 6D for still photos, which beats any of these smartphone cameras and my Panasonic GH4/Black Magic 4K cameras, which beat any of these smartphone camera 4K videos. If that’s the case for you, you don’t need a smartphone with the best camera, I am just showing you which one is better though. I hope this helps you in deciding your next smartphone and I should have more comparison videos coming soon. Remember, a perfect smartphone is the one that has the features you need. Smartphones still have its limits, they are nowhere near the quality of consumer DSLR/mirrorless cameras or 4K camcorders. But if you use your smartphone mostly for your photos/videos, you may want to get the Galaxy S6 or the LG G4 instead of OnePlus One. Dude! You called it the Oneplus One all through that article, even the pics have the wrong captions! Just to confirm, you were actually using a Oneplus 2 and not the Oneplus One? Next story Project Fi Unboxing & Setup on Rooted Nexus 6! Previous story OnePlus Two Unboxing!